If you’re like most manufacturing and distribution companies, you’ve started out with a hodge podge of manual and siloed systems to manage your business. Chances are, you use accounting software to record transactions, post them to the general ledger and generate income statements and balance sheets. A variety of spreadsheets, software and manual processes manage your sales, manufacturing, distribution and other operations. Manual business processes are cumbersome and time consuming!! 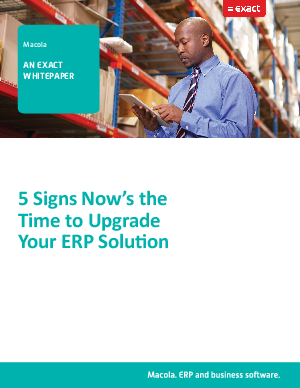 So how do you know when the time is right for your business to upgrade? Download now and consider these five signs.